Xing is a European-based career-oriented social networking site (similar to LinkedIn) that hosts users from more than 200 different countries, including 11 million users in Germany, Austria, and Switzerland. Xing has deprecated their public API as of January 2017. Because of this, new Xing applications cannot be provisioned. 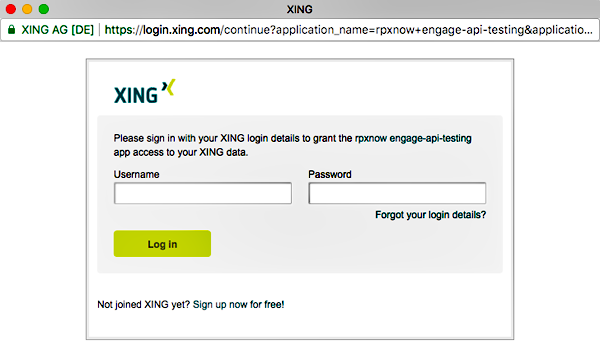 However, if you have a previously-created Xing application that app can still be used for social login. Log on to Xing Developers site (https://dev.xing.com). From the My Apps page, click the name of the app you want to use for social login. Copy the consumer key and consumer secret. 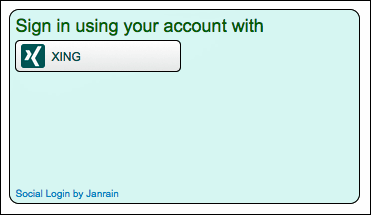 You can copy this information to a text editor, then close the text editor after you have configured Janrain social login. Log off of the Xing Developers site. Log on to your Janrain Dashboard (https://dashboard.janrain.com). From the list of Providers, click Xing. 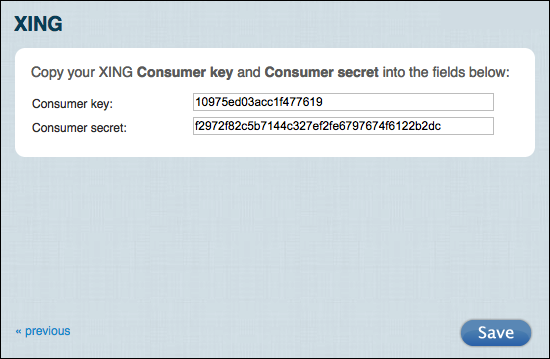 Paste your Xing consumer key in the Consumer Key field, paste your Xing consumer secret in the Consumer Secret field, and then click Save. Xing appears in your social login widget. When you are finished, select Save and Publish and then click Publish. It might take as long as one hour before Xing appears as a social login option on your web site. If login succeeds, information returned from the Xing profile is displayed in the API response preview field. The returned profile information will vary depending on the Xing account used in the test. From the Configure Providers page, click Xing. To change the Xing configuration, click Modify these settings. Although you can modify your Xing settings, you cannot delete those settings. If you delete the settings and then try to save your changes, you’ll see the error message Please enter your Consumer Key and Secret exactly as Xing shows them. This means that you cannot “unconfigure” the provider: once configured, the Xing icon will always be shown as green (i.e., configured) in the Social Login Dashboard. In the widget, click the X in the upper right corner of the Xing icon. Scroll to the bottom of the page, select Save and Publish, and then click Publish. Xing no longer appears in the sign-on widget.